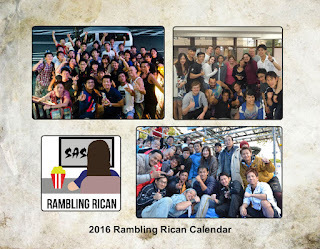 Rambling Rican: 2016 Rambling Rican Calendar is for sale! 2016 Rambling Rican Calendar is for sale! 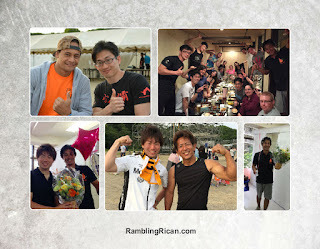 As I mentioned before, I'm starting to organize a small set of fundraisers for the another trip next year to Japan. Just like last year, my first foray into it will be the Calendar. Thanks to everyone who helped last year, I was able fly to Japan for the 31st tournament! My hope is to return to Japan (assuming in the Spring as the tournament date has not yet been announced) and interview as many people as I can to include in the book I'm writing on Sasuke's history. This year I was able to get a lot of information but not enough for what I was doing. Many changes to the format of the book occurred thanks to the trip experience. I noticed a glaring problem I had in terms of lack of information. I need to do more interviews and while some of that lack is slowly starting to get taken care of, the main bulk is still yet to happen. I'd have to overhaul the scale of the trip and do a better job in organizing more interviews. I guess I call it a rookie mistake. I was quite overwhelmed and not being in a native environment I did a poor job organizing more concrete interviews. I'm hoping to do better on the next trip in organizing those interviews in advance. Speaking of correcting mistakes, I overhauled how I did the calendar. I chose larger photos and removed most of the captions. I found it was a bit cluttered when I did put the captions even if I sacrificed identifying exactly who was in the photo. Given also that there were a lot more group photos, I had to make a choice and stick to just keeping it as clean as possible. The majority of the photos I took myself during my trip to Japan this year. The rest come from events and get-togethers that took place in Gunma Prefecture and the Sedai event that is an annual PTA event that the city runs. 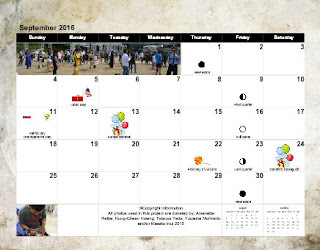 I'm happy to say that the Calendar is complete and finally up on the website! As usual thanks to Philip (from SMF) for designing my logo! I was blessed in having a few photographers who donated their photos (Kung-Cheen Howng 洪 恭芹 (aka "Jin), Tatsuya Tada 多田竜也, Yuusuke Morimoto 森本 裕介 and Sasuke Director Masato Inui 乾 雅人. I also added more birthdays of those involved and featured some of the Sasuke regulars (like the All-stars/Shin Sedai) to fill out the months. Full disclosure on the "fundraising part" of the Calendar Project. I'm getting about 5-7 dollars per calendar created. All of the prices are up on their website along with a description as to how this works. I was happy with last year's trial run and decided to use the same site again. The calendars are only printed when someone orders them as opposed to other companies that require for a certain amount to be ordered up front. While they also had an option to do a fulfillment drive (like they do in local schools with the sign up sheet) I chose the other route available since the amount most people would get would be much smaller. The company will be doing the fulfillment so I don't have to be the middle person. I won't know who orders what from as the website since they take care of that privately between the buyer and them. So far I've had zero issues other than creative issues on my own. I appreciated they had no set up fees (some websites can cost 100-200 bucks just to set up) and again, my experience from last year was quite positive. As you know my order is in hope it sells well for you. I am a newby for Sasuke but LOVE IT ! I have a question: On Masashi Hioki fluff on Sasuke 31, it shows his beautiful wife and 2 young children; a girl and boy. Then later, outside it shows Hioki with an older boy, about 8 years old? That looks just like Hioki. I believe it IS his son but I didn't see him at Sasuke 31. Can you give me some insight whether that was Hioki's son, brother, or sibling's child, or perhaps a previous marriage child? No, Hioki doesn't have an older son nor is he divorced. He's surrounded by family and their kids. As to who it is specifically I don't know but he had both sides of the family (his and his wife's family). Hi RICAN! You are awesome man - I love your coverage and news of extreme obstacle intensity and action!!! Hey - just a quick question - do you know of any way to enter Sasuke or any major comp for an Australian? I qualified for ANW - but was not allowed due to not being US citizen! I am the current Official Guinness World Record holder for Rope Climb & Weighted Chin Ups and would smash the courses! Sadly there isn't a path for foreigners living and working outside of Japan to enter Sasuke. The only thing I can say is attempt to apply to Sasuke when the application in Japan is made available. When they make an announcement (I almost always do a post on it) they make an online application (in Japanese) for entries. Generally in the past that was open to residents of Japan or foreigners living in Japan with work visas. To my knowledge that hasn't changed but it doesn't hurt to ask when the application is public. I would definitely mention your credentials and nationality. I know they are always looking for a variety of participants. In the interim I suggest following Masato Inui from Folcom on Twitter. He's the Director of Sasuke and while he does not select the competitors, he may be able to point you in the right direction. Outside of that I can't help much. Marcus! The application is now out for Sasuke 32! Send an application and see if you get any results! Good luck and keep me posted! Unofficial Sasuke Update Show #2 on Nico Nico!